What’s your process when creating your work? I usually figure out what sort of topic I want to work on, then I gather references for the main object and start working on it. During the process. I’m thinking of environments I could build around it. Once I have a rough model of the main object done, I start gathering references for the environment and blocking out possible scenes. When I feel like I’ve found good camera, light angles and an environment that could work well, I start working on detailing the models and creating textures for them. During this phase I often adjust or move stuff around a bit, until I find something I’m happy with - this can often be a real pain when I can’t decide which version is better, so I try to power through this phase as quickly as possible before I have time to start doubting my previous decisions. The last part of the process is adding details to the scene to make it seem more alive – this can be trash, moss, ivy, graffiti, pieces of wood, rocks, needles, leaves, cans, bottles, cables etc. Then I just render it, take it to Photoshop and post-produce it a bit. There’s a clear sense of melancholy behind your work. Where does it come from? I’m not quite sure to be honest. With the first images like the Happy meal, Pacman, Space Invaders and Mario, I suppose I was kind of remembering how I used to adore these things when I was younger. I come from a post-communist country, so when I was younger a lot of Western culture just started getting here. For instance, Happy Meals were a really special and big deal for me when I was a kid. Back then there weren’t that many McDonald’s in Prague and when they’ve opened one quite close to my home I wanted to go there all the time. I’d even force my parents to take me to McDonald’s to celebrate my birthdays. The same with old computer games – we didn’t have a computer at home until I was roughly eight, and all the computers we had at school were super old, so while people elsewhere played cool 3D games in the 90s and early 2000s, me and my friends at school would play old vintage games on 486 computers for hours every day in the computer lab. Both of these memories seem a bit bizarre to me now, but I can’t help but feel bit melancholic about them. I guess this sort of vibe translated over to the rest of the series, because I wanted to make it both visually and thematically unified. I don’t believe in religious apocalypses. But I do believe it’s possible there could be some sort of “apocalyptic” event sometime in the far future – I think it would be a miracle if nothing major happened ever again. You have a knack for creating beauty out of devastation. How come? I think in this case it is more of a coincidence rather than some thoughtout process. I initially started the series to learn how to create better textures. Some of the most complex surfaces to achieve are old grungy ones because there are a lot of layers in them (base metal, first paint layer, second paint layer, rust, dust etc.) and it’s quite hard to blend them well. After this turned into a whole series I just kept testing different ways of creating old and used surfaces, while trying to create at least semi interesting images as a whole. Your work seems to reflect the death of an era. Are you hopeful about the future? I am very hopeful about the future! As a geek I’m quite excited by every little advancement in technology and I can’t wait to see what the future holds for my generation. You often use pop culture icons in your apocalyptic imagery. What’s your take on our current pop culture? Truth be told I don’t really follow current pop culture too much and when I hear or see some of the current pop stuff I’m quite glad I don’t even bother following it. In my late teens I got really into drum and bass/techno music which is sort of anti-pop culture, so I guess that had a big impact on my current taste. I do like to watch some popular TV shows or movies here and there, but I mostly prefer more alternative/indie options. Your work often portrays nature taking over what humanity once took away from it. What’s your take on technology versus nature? I believe nature will always find a way to survive, even if people think we can control it. Last year I went on a trip to Chernobyl Exclusion Zone and I was just amazed at how quickly nature took over the ghost town called Pripyat. The accident happened in 1986 and it contaminated the area so much that all the plants died for years, but now, just a bit over 30 years later, it is really hard to tell that you are actually in an abandoned town – it just looks like a regular forest with apartment buildings, schools, hospitals and factories scattered across it. As a 3D artist, technology is directly correlated to your craft, and yet its often victimized in your work. What’s your relationship with technology? I love technology. I’m always on the lookout for new tools and updates in my field. I also check a ton of tech sites and YouTube accounts daily, and while it really kills my productivity, I really do enjoy doing it. Just recently I had to rebuild my entire workstation because I needed to water-cool my graphic cards and it was a lot of fun, even though I almost destroyed my computer at one point. What’s it like being an artist in the midst of the digital revolution? I think it’s great to be part of this. The possibilities nowadays are crazy – one post that goes viral can change an artist's whole life and while the saturation of art online goes up every day, it’s still not as crowded as people might think and these things happen quite often. Of course, now more than ever, artists have to always innovate and keep up with the latest tools and tech in order to stay on top of things, but this is relevant to pretty much every field these days. How does an artist make a living out of his/her work in the digital era? I’d say most of the income would be from commercial jobs. People who do a lot of personal work like me can also make some money on the side from selling prints and other ‘merch’. I’ve also seen a lot of people using sites like Patreon to get additional income. And lately I’ve noticed many people got into creating and selling tutorials and assets. What are the pros and cons of social media as graphic artist? A pro would definitely be that my work is seen by a lot of people, which can lead to a lot of potential jobs. The con is that the majority of these job offers and various requests are not really ‘serious’, so I tend to waste quite a lot of time and this gets a bit frustrating. Another pro is that it feels really great to get all the feedback and love from the people when I post a new image, it’s a great boost for motivation in my opinion. I know many people say they don’t care about likes and comments at all, but I think that’s a load of BS – why even use social media then? Another con would be that my work gets stolen, used and shared uncredited ridiculously often. I’ve kind of gotten used to it though, so unless it’s a really big deal I just let it slide most of the time. 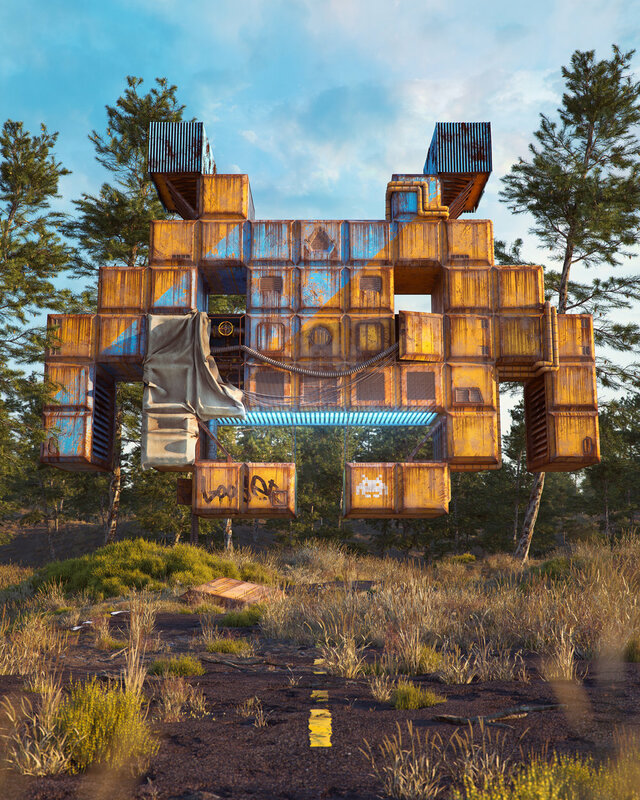 What’s next for Filip Hodas? I’m planning to do one last image in my pop culture series and then I’d like to go back to some more experimental stuff for a while and learn animation. I’ll probably do some more pop culture images later on, but I just need to do something else for a bit. I’m also thinking about this idea of turning the pop culture series into animations, but I’m still not sure if that’s doable within a reasonable timeframe.